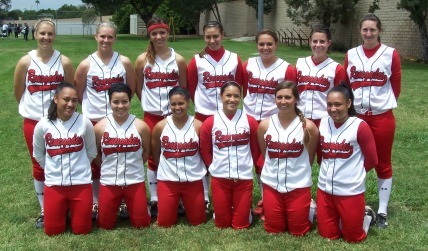 We are a 18U ASA-USA Junior Olympic Fastpitch Travel Ball team based in San Diego, California. The team is comprised of players from all over San Diego County. These ladies were selected based on their individual talents, abilities, sportsmanship, competitiveness, and of course, for the “love of the game”. This TEAM is all about positive attitudes, dedication to their teammates and coaching staff. Our team attended the 2008 16U ASA-USA JUNIOR OLYMPIC NATIONAL CHAMPIONSHIP IN OWENSBORO, KENTUCKY. The goal of the team is to become the 2009 18U ASA National Champions. Congratulations to the San Diego Renegades (Wynns) team for being crowned 18U-A Calfornia State Champions after going undefeated (7-0) throughout the tournment in Riverside, California. The team is also qualified to compete at the 18U-A Nationals in Las Vegas, Nevada in July. Caitlin Byrne, a 2009 Pitcher / Outfielder from Cathedral HS, has committed to play at Chico State in northern California. She joined Renegades in Fall 2006 and attended 2007 & 2008 16U Nationals. As a lefty pitcher, her movement on all pitches got the attention of many schools. Her hard work and great attitude will help her succeed at Chico State and in the future. Congratulations, Caitlin!